Hopwood-based artist Paula Hamilton meets the Lickey Hills Art Society. 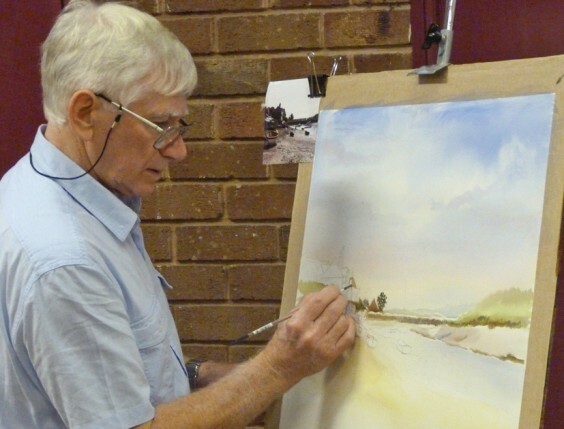 On the first Saturday evening of every month, Lickey Hills Art Society meets at Longbridge Methodist Hall to watch demonstrations, talk about art and socialise. The members describe themselves as “a friendly bunch of artists and those interested in art”. When I called Jon Haynes, the current Chair, to arrange a visit he was certainly friendly, and happy for me to come and join one of their meetings. It’s both strange and interesting to turn up somewhere one has never been before – I always wonder if there will be just a few people in a draughty church hall trying to get something going, or if there will be hordes of people and a hive of activity. Lickey Hills Art Society is certainly in the second category! On the evening I visited there were five separate demonstrations going on with a group of interested artists or art lovers in each group, and the place was buzzing. There was Graham Wilson, who trained and worked as a draughtsman, with a black drawing pen in hand and watercolours at the ready to add colour to his skilful cartoons. These were clever and competent drawings that Graham’s admirers were delighted to see developing quickly in front of their eyes – and this was not done in reverential silence; there was chat and banter as well as cartooning going on. Jill Johnson, appropriately dressed in a bright abstract print, was showing a another group how to create a seascape, using wax candle to resist paint and create texture, followed by the use of cling film to cause waves in a blue wash for the sea. Stuart Hudson (above) is clearly a respected and revered local watercolourist. His audience was watching in awe as he firstly put on an impressive big sky and then started to add buildings and detail as his landscape came alive. By the time my hour-long visit came to an end Stuart had added an estuarial river mouth, buildings and trees. Jo Lloyd, a highly accomplished painter who I first met at the Barnt Green art exhibition last year, had a rather different set-up. She had set out a teaching table with a folder of exemplar work, a collection of attractively veined ivy leaves to draw, and coloured pencils with which to complete the task. Jo was demonstrating and then helping her group of six pupils to complete their drawings beautifully. On the fifth table a lady, who did not want to be photographed, was drawing a charming picture of a young child on a beach in chalk pastels. Five demos on one evening – awesome! Plus hot drinks and cakes, a bring and buy and a competition which is set each month and the winners named and rewarded. And because Lickey Hills are about to open their annual art exhibition on Saturday October 6, members had brought along paintings they plan to show so there was a gallery of impressive work for me to see. I had a chat to Jon after looking at all that was going on, and he informed me that this is a long-established club that has been running for 38 years. More than half the membership are watercolourists, with many other members working in acrylics and a few who use oils, pastels and different media. Jon, a self-taught painter who says he always found drawing easy as a schoolboy, is the son of a commercial artist who only took up painting four years ago. He told me that he comes from the “just push colours about” school of painting, and this he does very proficiently. He is photographed with his painting of two Highland stags entitled Stag weekend –he’s a humorous man who doesn’t take art too seriously, but seriously enough. In their forthcoming exhibition around 25 artists will be showing their work, with more than 100 paintings on display. Prices are in the region of £50 to £100 and subject matter will range from landscape to flowers, animals and much more. This is seriously affordable art of good quality! Longbridge Methodist Hall has a free car park and is on the Bristol Road near Great Park. It is well worth a visit and you might even decide to join this friendly bunch on a monthly basis, too.